This letter is a Call for Proposals for System Verification (SV) proposals to use the Altair Laser Guide Star (LGS) system. Two nights will be available for LGS+NIRI and two nights will be available for LGS+NIFS. The deadline for proposal submission is June 16, 2006. The Altair Laser Guide Star (LGS) system is currently undergoing science commissioning at Gemini North Observatory. 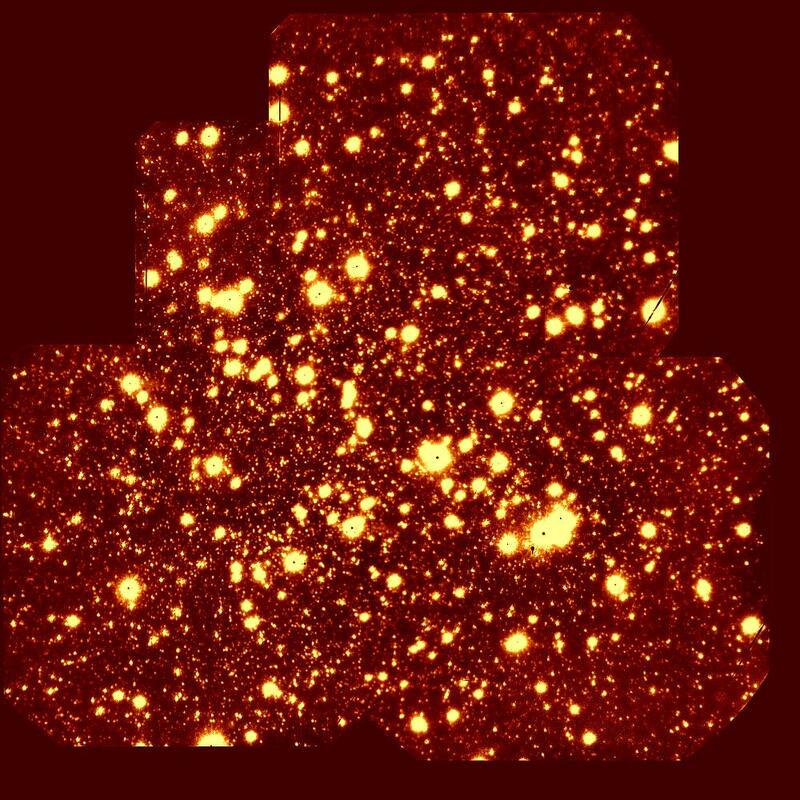 LGS will provide users with high angular resolution for science targets within 25 arcseconds of faint (R ~ 18) guide stars. This represents a roughly factor 15 reduction in flux requirements over the Natural Guide Star (NGS) system which has been in place at Gemini since semester 2004A. The LGS system can be used to feed either NIRI (for imaging or longslit spectroscopy) or NIFS (for IFU spectroscopy). Please see the Altair LGS page for a brief overview of the LGS concept. The technical commissioning of LGS was completed on April 18, 2006 when all correction loops were closed simultaneously and light was delivered to NIRI in a mode typical of science use. We are still conducting the science commissioning of LGS, which involves characterization and optimization of the correction and streamlining of the nighttime operations. At this time, we are pleased to invite the Gemini community to propose System Verification (SV) programs for LGS. We anticipate 2 nights of SV time for LGS+NIRI and 2 nights of SV time for LGS+NIFS will be available for SV. Observations are planned to start in August, 2006 and will be integrated into the Gemini Queue for execution. LGS will only be planned for CC=50 conditions, although propagation and observation execution is possible in the thinnest CC=70 conditions. Note that we currently plan to issue a separate call near the end of July for Demo Science (DS) observations, for which about 9 nights will be allocated. See below for the differences between SV and DS. NIRI/LGS f/14 image of the Eagle Nebula. 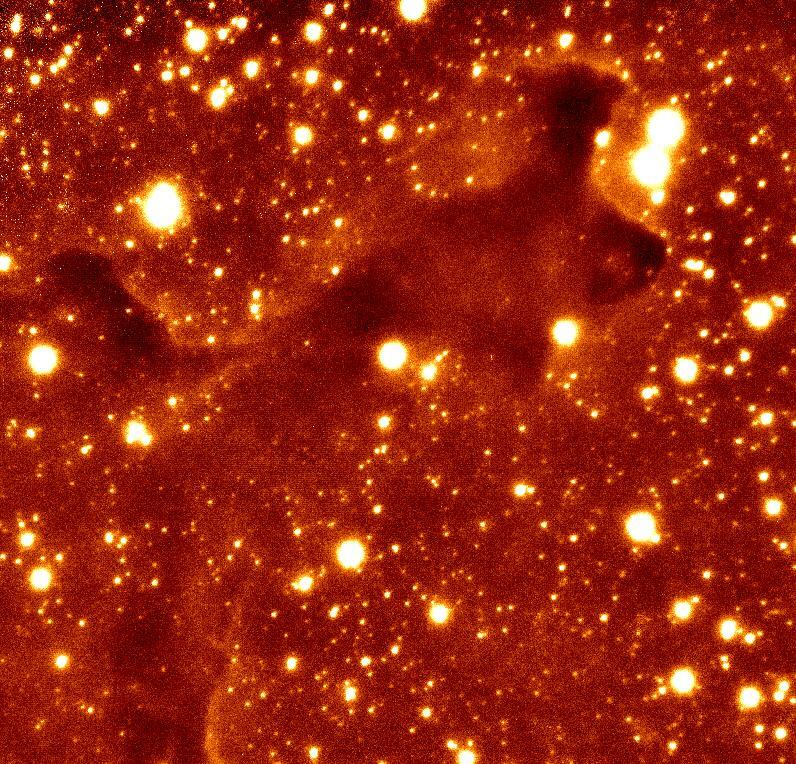 This image was obtained in typical LGS mode, with a single tip/tilt star (slightly above and to the left of center). Field of view is about 40 arcsec per side (click image for full size). NIRI/LGS f/14 image of M13. This image was collected with several different pointings, each using a different tip/tilt star centrally located. Field of view is about 100 arcsec horizontal (click image for full size). Note that both of the above images were collected prior to image optimization. We expect to be able to improve the point spread function and Strehl ratios substantially from the above images during further commissioning. The images were collected to illustrate the two major modes of LGS operation as well as highlight the fairly low anisoplanatism seen with the LGS system. See the Hot News page for the most up-to-date information. System Verification is the final step of testing prior to general use of the instrument by the Gemini community. It is intended to verify the readiness of the entire system from observation definition to data reduction. It is also intended to exercise the various modes of an instrument and demonstrate to the community, through interesting and challenging science programs. Collaborations for LGS SV projects within the Gemini partner countries are highly encouraged as we have a limited number of observing nights and cannot do a large number of projects. Please circulate this call within your community. The purpose of SV time is nominally to test the system in modes typically used for science as well as provide additional data to the LGS team to estimate performance under a wide variety of observing modes. In particular, we wish to probe as many aspects of LGS tip/tilt star brightnesses and separations as possible to begin to build a database of correction performance versus guide star selection. Note that an additional ~9 nights of Demo Science (DS) will be made available in September to a few programs. A separate DS call will be made in late July for these nights. Demo Science will be designed to produce a database of interest to the larger scientific community with a small proprietary period. "SV observations will be selected by SV team members and approved by the Gemini Director. They will span a wide range of targets and perspectives and the SV teams will be responsible for providing written, in depth assessments of SV observations and mode verification within three months of data acquisition. The data obtained during SV will be made available by ftp to the international Gemini community and the assessments will be published on the Gemini SV web pages. Community participation in the further evaluation and assessment of the SV observations will help ensure that Gemini is a success from the first date of scheduled observations." Full details are available of the SV process. Performance: We estimate that the following tip/tilt star limits will most likely hold to about 1/2 a magnitude, and the Strehl performance will likely not change by more than a factor 2. High Strehl Correction in H, K and L (1.6 to 2.5 microns) requires a bright (8.5 < R < 15) tip/tilt star within 15 arcseconds of the science target. Delivered Strehls should be about 75% of that seen for NGS: 20% in H and up to 35% in K. L-band LGS has not been tested. The background in L will be considerably higher with Altair in the beam. We believe that some signal-to-noise improvement is likely at L and angular resolution will be close to the diffraction limit. Observations shortward of H (such as z and J) should not be considered High Strehl even for bright tip/tilt stars. Low Strehl Correction will occur with a faint (15 < R < 18) tip/tilt star within 25 arcseconds of the science target. Delivered Strehls should be a few percent in J, up to 10% in H and K. The 25 arcsecond limit is a hard limit based on the Altair optics, i.e. guide stars further than this cannot be observed with LGS. All observations shortward of H (1.6 microns) should be considered Low Strehl. Note that if your Guide Star is brighter than R < 8.5, you should use NGS instead of LGS due to the danger of damaging the tip/tilt wavefront sensor. LGS+NIRI Imaging is available at J, H or K with f/14 and at J, H, K or L with f/32. LGS+NIRI Spectroscopy can be performed in J, H or K at f/32 only. LGS+NIFS IFU Spectroscopy is available in the z, J, H and K band. See the NIRI or NIFS webpages for more detailed science instrument information. To compute exposure times and sensitivity, use the NIRI+Altair or NIFS Integration Time Calculators (ITCs) with the following modifications: (1) all LGS observations are conducted with the Field Lens, so divide the effective guide star separation by 4 before input into the ITC and (2) all LGS observations should increase the effective brightness of the tip/tilt star by 3 magnitudes. Thus, if using a 15 arcsec separation R = 14 magnitude star, one would input 3.75 arcsec separation and R = 11 into the ITC, yielding a 33% Strehl in the K-band. If using a 25 arcsec separation R = 18 magnitude star (the current limit of our correction ability), one would input 7.5 arcsec separation and R = 15, giving a 11% Strehl in the K-band. To compute observing overheads, add 5 minutes of extra setup per pointing (a pointing is defined as a unique tip/tilt star). Note that dithers using the same tip/tilt star do not require a separate setup, but will incur an additional ~5 seconds per dither position above NGS overheads. This number may be reduced as we optimize the system. Note that the Phase I Tool (PIT) does not have the latest LGS information, so you should manually select your guide star based in its R-band magnitude and distance. To submit a program, you must use the 2006B Phase I Tool and include observing constraints, target lists, and instrument configuration information. Submit the program through the Phase I tool interface by June 16, 2006 for full consideration. Before submitting, select the button labeled "Demo Science or SV" in the PIT and enter the time requested; do not submit LGS SV proposals to any other Gemini partner. Scientific justifications should be brief and clearly state which modes are being tested. Technical justifications should be complete enough that feasibility can be assessed easily. In particular, guide star brightnesses and separations must be included. PIs seeking SV time will be informed of the results of the selection process by July 10, 2006, and Phase II files (using the Observing Tool) for selected programs will need to be completed by July 24. Disclaimer: Submitting an SV program or even having a SV program selected as high priority does not guarantee that data will be taken. Selection for SV will also be based on the abilities of the proposers to reduce the data and return feedback within a reasonable time. The proprietary period for SV data is three months. At the end of the 3 month period, PIs and their collaborators will need to provide reduced data for public release. Please feel free to contact us with questions or comments - we look forward to hearing from you and reading your LGS SV proposals.